At the airports in Namsos, Rørvik, Brønnøysund, Sandnessjøen and Bodø you may pick up and return bikes. With Brønnøysund or Sandnessjøen as your starting point, you have access to a network of archipelagos consisting of more than 12,000 islands. 5-day toursuggestion starting in Brønnøysund or Sandnessjøen. Experience Norway's most exciting and spectacular island - Leka, beautiful Abelvær, and the protected fishing village of Sør-Gjæslingan. In this suggested tour, which can be done in 4-6 days, you hop from highlight to highlight along the Namdal Coast. What is Fly & Bike ? With Fly & Bike you can pick up and deliver your rentalbike at the airport. It is of course also possible to pick up the bike at the local dealer (in many cases the tourist office), you choose this when you book. In our online booking you may book from all airports along the coastal route ! We at the Kystriksveien Info-center may assist you in planning a trip along the Nordland coast between Steinkjer (Trondheim) and Bodø. If you have any practical questions about Fly & Bike and bikerentals please contact us. Email / Tel. +47 74 40 17 17. At the Helgeland coast you find the airports in Brønnøysund and Sandnessjøen, and one of the most popular routes is between these two starting points (see toursuggestion on this page). 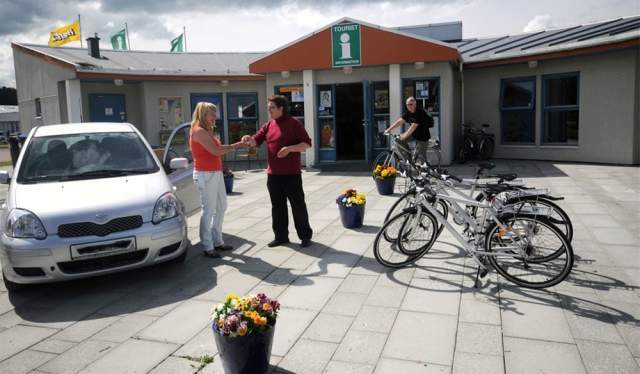 The big advantage is that you have one-way rental between the airports, so you may pick up the bike at e.g Brønnøysund and deliver it in Sandnessjøen. At the south part of the Kystriksveien you may use Fly & Bike at both Namsos and Rørvik airport. New in 2016 is the possibillity to have one-way rental between Namsos and Brønnøysund/Sandnessjøen. Please contact us for toursuggestion on this route. Bodø as starting point is getting more and more popular. Many people go to the Lofoten islands from Bodø, but we may provide you with a fantastic trip going south to Meløy and the Svartisen glacier. Please contact us for information on this route.